It’s that time of year again! I feel like Thanksgiving is the kick off for the start of the Christmas season. I don’t mean to minimize Thanksgiving, but it seems that our already busy lives just kick it up a notch until the new year. So often I feel like Thanksgiving comes and goes and we don’t do much to prepare or to spend time remembering why it is we celebrate this holiday or even take a moment to remember ways in which we have been blessed. After reading One Thousand Gifts it made me think differently. To see God in the little things and be thankful for the little things really changes your perspective. The not so great events and discouraging moments in life don’t get me down as much when I have filters over my eyes to see blessing over pain. For those who know me I like to have everything neat and tidy and put in it’s place, which frequently doesn’t happen with three little ones running around and a baby usually strapped to me! However, I’m so thankful for cheerful, energetic little ones who can run around, talk, (even shout which is more likely than just talking), and play together. I need to do a better job being thankful even when I lean up against the table and I get maple syrup stuck to my forearm, or in my bare feet I step on part of a banana that somehow made it onto the kitchen floor instead of the trash, or I find model paint on the new carpet in the boys bedroom. This year we did a little project as you can see from the photo. I certainly didn’t come up with it! I saw it somewhere… probably pintrest, or a magazine someplace. One evening last week we had an early dinner and decided to work on this together before bedtimes. 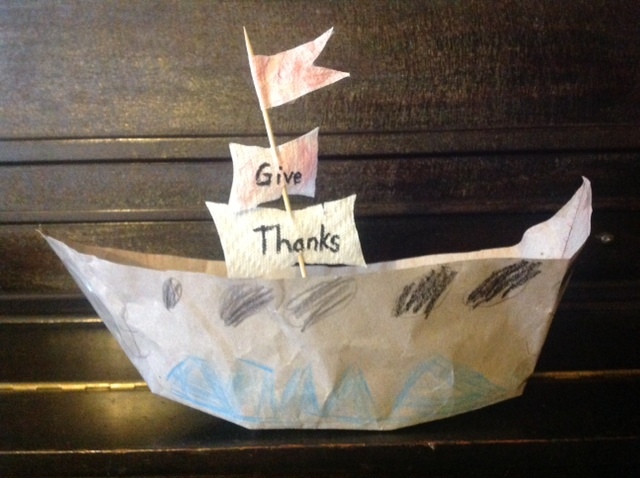 It’s my goal to have everyone write on a little piece of paper something they are thankful for each evening at dinner and put it in the boat. I thought it would be fun to share them on Thanksgiving. However… we haven’t done so well filling the boat! So we may have to continue it for a bit after Thanksgiving! I just wanted to share it with you in case maybe it might help you celebrate Thanksgiving! I hope you have a very special day with loved ones; with good food on the side!